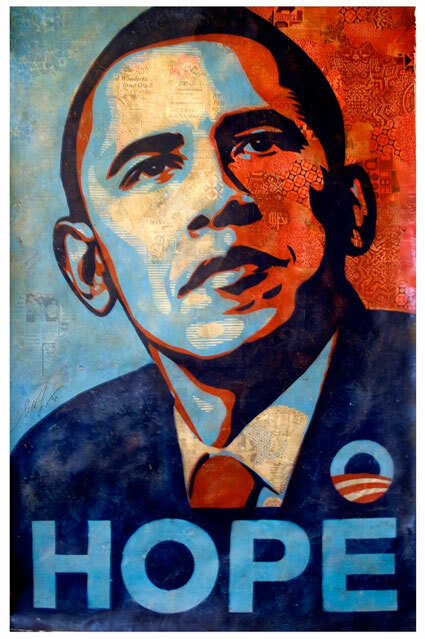 In an exclusive interview with National Journal on Thursday, Shepard Fairey expressed his disappointment with the president -- a malaise that seems representative of many Democrats who had great expectations for Obama. Fairey explained that when he came up with the poster in 2008, he was trying to find a single image that embodied the issues he cared most about -- promoting health care, helping labor, and curtailing lobbyists. He likened the issues to projectiles. "Looking at Obama's standpoint on various policies, it was like, 'Why throw all these particular projectiles over the wall... when I could put all those things in one projectile that I could hurl over the wall,'" Fairey said in a phone interview from Los Angeles, where he lives. "Obama was the delivery device in theory. Now, I realize that he maybe is not the correct delivery device, and I'll just deal with those issues separately." ... "There's a lot of stuff completely out of Obama's control or any of the Democrats' control," Fairey allowed. "But I think there's something a little deeper in terms of the optimism of the younger voter that's happening. They wanted somebody who was going to fight against the status quo, and I don't think that Obama has done that." Madhani sighs, "Maybe it was inevitable that Hope would fade." However, he notes that Fairey "saved his harshest criticism for the Republicans." The artist "still supports Obama, and he says he would use his talents to assist the president's re-election efforts in 2012. But he said that he couldn't design the same Hope poster today, because the spirit of the Obama campaign hasn't carried over to the Obama presidency."